Your tyres are one of the most important safety features of your vehicle. The way they stick to the road will stop you ending in a ditch or unwillingly plowing through a pedestrian. So it is important to check them every month. The added bonus of having good tyres, is that you will be increasing your fuel efficiency as they will perform better than worn tyres. As they age, the rubber compounds used in tyres can deteriorate, even more so if the car is left parked for long periods of time. With age, the rubber hardens and cracks can appear, or lumps form to the side of the tyre. 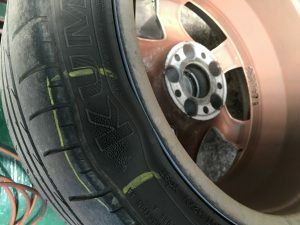 Both are a sign that the tyre needs changing, even if you still have plenty of thread on them. If you look at the ‘K’ in the photo above, , a lump causes the distortion of the letter. This may have also been caused by Kerbing or in this case, hitting a pot hole. 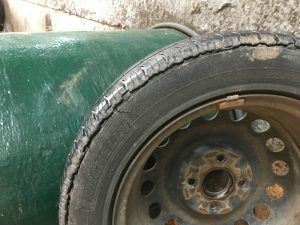 The tyre in the right hand side picture show a crack running all around the circumference of the tyre this is mainly due to age. Check the tyre pressure when the tyres are cold, at least once a month or before going on a driving holiday in the UK or through the continent. Your car hand book should tell you the right pressure for your tyres. If you notice a significant drop in tyre pressure, it is best to have the tyre checked by a specialist who will inspect the inside and outside of the tyre. 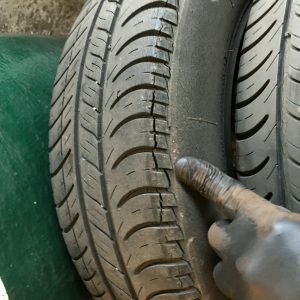 Check the thread, under 1.6 mm you are breaking the law and the tyre is too worn out. Time to replace them. Be careful though as the says you need to have the same thread patterns on an axle, i.e if your front tyres thread doesn’t match you are breaking the law. If you are planning to drive in France, the law says your tyres must be less than 5 years…. Suspension Alignment, if you have hit a kerb or pot hole, your suspension alignment can be slightly out, this will affect the road holding and become a safety risk. If you feel this may be the case, you can book your car with us and we will check it for you.